Many articles have been written about the case of three seismologists, two engineers, a volcanologist and a public official who have been sentenced to be jailed for six years on 22 October in L’Aquila, Italy (although this sentence may be reduced on appeal). These members of the National Commission for the Forecast and Prevention of Major Risks were found guilty of manslaughter for ‘falsely’ reassuring or ‘over’-reassuring people in the Italian town of L’Aquila about the likelihood of a major earthquake at the end of March 2009. Soon after the announcement, on 6 April, the town was struck by a major earthquake and more than 300 people died. Prosecutors and victims‘ relatives claimed that 29 of those who died would have left their houses if they hadn’t felt reassured by the authorities and that these lives could therefore have been saved. Scientists, scientific organisations and politicians have protested against this verdict by an Italian judge. Many stress that predicting earthquakes is near-impossible; some stress that this was not the issue but that being overly reassuring was. In the context of the ‘Making Science Public’ project this verdict poses many questions and raises many issues, mainly around science, risk and uncertainty communication, the role of scientists in public policy, the role of scientists working for government advisory services, the division of labour between advice providers and advice communicators and many more. I shall highlight some of these issues here in a cursory fashion, but will focus on the impact of this case on impact, (openness) and the communication of uncertainty. This jail sentence has shaken the scientific community (where many work as scientific advisors, for various reasons). Some see it as a return to a medieval witch hunt and the dark ages, some as returning to the days of Galileo’s trial. Some fear that it will lead to more lives being lost, as seismologists will no longer work in Italy or, indeed, for the Italian state, and as risk communication will be compromised (many more earthquake warnings might be issued in the future, just to be on the safe side, for example). 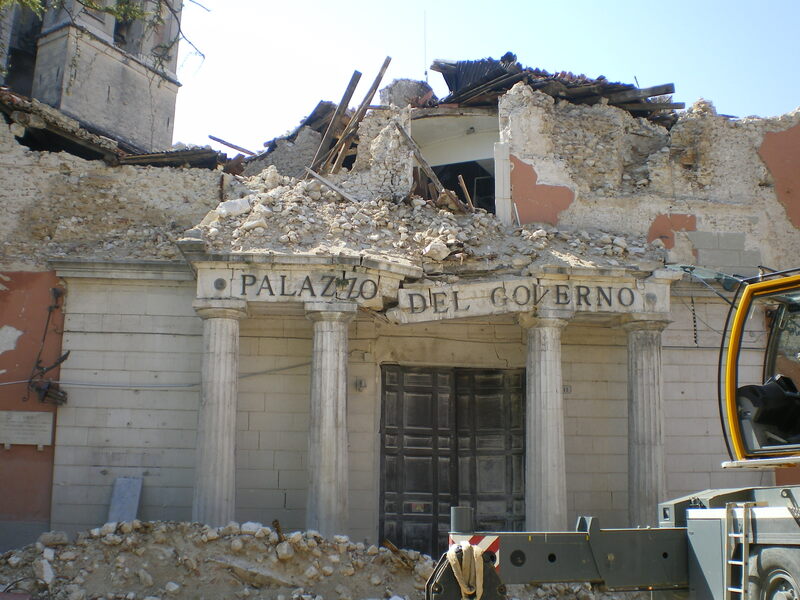 Many worry that it will deter scientists, at least in Italy, to engage with the state as scientific advisors, not only with relation to earthquakes. Some, like the UK’s Royal Society and the US’s National Academy of Sciences, see a danger in this verdict becoming a legal precedent which, “could lead to a situation in which scientists will be afraid to give expert opinion for fear of prosecution or reprisal” (others think this is less likely, at least in countries other than Italy). In general, however, after this verdict, many scientists, natural and social, are beginning to rethink what it means to give scientific advice, what it means to communicate science, uncertainty and risk, in short, what it means to make science public, especially in high-risk situations and in situations of public confusion about risk. One issue that has not yet been discussed is the impact that this verdict may have on what we here in the UK call the ‘impact agenda’, A few days ago, Patrick Dunleavy asked us in his advice blog on how to achieve impact in the current REF exercise: “Did your contacts or involvement continue over a period of time? Can you show that your impact was not a one-off, but something that lead to continuous consultation, advice-giving or involvement? Did the research lead (even indirectly) to consultancy or contracts or other applied work? Did it perhaps lead to an appointment to a government or professional advisory committee?” In the context of the l’Aquila verdict academics writing ‘pathways to impact’ will from now on have (to put it somewhat dramatically) the spectre of a prison sentence hanging over the end of the path, the point where impact is really achieved or achieved in the so-called ‘real world’. Coming forward to give (albeit in this instance, in hindsight, bad) scientific advice may not rank so highly anymore in the scramble for impact. We may have to think long and hard about whether influencing government policy is necessarily a ‘good thing’, that is, we have to think about the ethics of impact. Another hot issue at the moment is openness (open source, open access, open data, and, of course, greater openness about uncertainty etc.). What will this verdict mean for openness, most importantly for openness about uncertainty? Scientists are generally exhorted to be honest about uncertainties. This is difficult in situations where certainty is what people expect to hear. So how do you navigate between the Scylla of being open about uncertainty and the Charybdis of public and political expectations regarding pronouncements of certainty, as well as, and perhaps more importantly, between the rock of scare mongering and the hard place of ‘complacency mongering‘? But will we still have the courage? 2. Not to engage in informal communication using social media on that issue. This is sound advice and at least provides some signposts of how scientists and science communicators can move forward post-L’Aquila in making science public and regaining public trust. More lessons for earthquake forecasting and risk communication will surely still be learned from this episode. Very good analysis, Brigitte! Independent of your writing this post, I did something for Klimazwiebel and came to a similar conclusion: it takes courage for scientific experts to “tell the truth” (using a shorthand here, I think we know what this is supposed to signify), whatever it may be. But this is an alarming finding – it comes down to saying good policy advice depends on personal virtues. The challenge is to devise institutions which will make this possible as routine behaviour. I would not want to rely on heroes. A very good point indeed. I totally and utterly agree with you! Will look at the Klimazwiebel now. Thanks for this article, particulary the link to the Nature report. I note that one of the commentors there points out that in N Zealand they simply publish the %age risk and let the population make up their own minds about how to respond. This seems like a sensible approack to take. Much of the problem in this kind of case seems to stem from a public official trying to turn a number “e.g 2% risk of a severe earthquake in the next 2 days” into a form of words – usually a form or words that is less informative than the simple percentage was. Yes, this is also something that I came across and I agree it’s a good idea, in principle. However, it all depends on ‘the population’, how used they are to ‘making up their own minds’, how used they are to interpreting data, how willing they would be to do it for themselves etc. It would be great to monitor how this works out in New Zealand. I also begin to wonder how things are done in Japan, California and so on. A whole new avenue of research opens up, although I bet somebody has compared all that already!